Investing in custom sports magnets is a great way to show your loyalty to the sport. You can indulge in these promotional magnets for showing your support to the local team, national team or community. Whether it is on a fridge door or a car door, personalized sports magnet is perfect to show your team pride, sports spirit and love for your local sports team. The sports magnets from Custommagnetsdirect.com make excellent promotional gifts year-round and during the sports season. DISCLAIMER: Custommagnetsdirect.com is not affiliated with any National Collegiate Athletic Association (NCAA) or other local or professional national teams. All team schedules or team graphics or information is the trademark of their respective owners and they do not endorse any of our products. 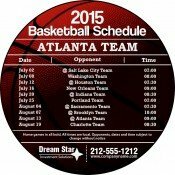 Target your community by handing them these basketball schedule magnets! Either professional or college basketball, it does not matter to us because we are always ready to offer you what you want. The season is going to kick off in the last week of October, order now for best prices! These promotional basketball schedule magnets are perfect gifts from October–April! With an estimated fan following of 111, 000,000 and being termed as one of the highest professional sport in the world, any information regarding National Football League is sure to buy attention. We offer the freedom to select from our vast collection. 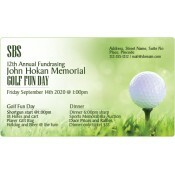 Personalize your schedules over these promotional magnets prior to handing it out. 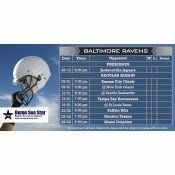 The National Team Football Schedule Magnets are a perfect year-round gift. Usually the NFL season kicks off in the week after the Labor Day and lasts through the week after Christmas, offering a good 17 week entertainment. Football is a sport which unites people of all ages across USA. 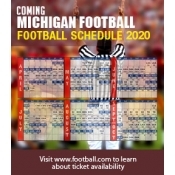 This means our football schedule magnets are going to be one of the most intelligent tools to connect with your prospective customers and connect with your current clients. A great gift for the whole year because football is one of the favorite pastimes for any average American! 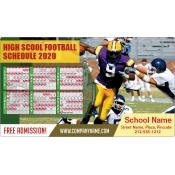 High school football schedule magnets lend you an opportunity to show your team pride and support for the local high school football team. You can easily select from any of our magnets and get it customized in the way you want, complete with the school’s name prior to distribution. 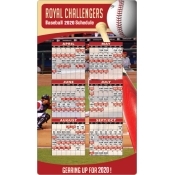 Do you know that by handing out baseball schedule magnets, you are targeting one of the largest segment of your consumers! You have 162 chances to make an impact because 162 Major League Baseball (MLB) games are played in a year. The MLB is registered as one of the highest seasonal attendances in 2013 with 74 million spectators! Perhaps by giving away these special magnetic racing schedules, you are going to race into the hearts of your prospective customers! Can you imagine? It is one of the most attended single day sport across the globe! By investing in these golf schedules magnets, you are targeting a year of non-stop exposure because a golf season lasts from October to September of the next year. Golf is one of the sports with long seasons and had the highest turnout of 12 million people in 2009. 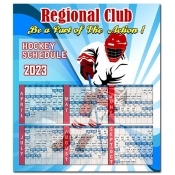 By distributing these hockey schedule magnets, you are targeting some avid sports fans in your area and joining the league of 4.5 million supporters who follow the game. Avail free ground UPS shipping anywhere within the contiguous USA. Save on art setup, online design proof and full-color printing because their prices are included. Do you wish to give out school mascots? You can select from our custom shaped magnets or custom die cut magnets and approach us with your requirements. Do you think our selection of custom sports magnets is incomplete or missing on something? Feel free to share your thoughts with us by giving us a call at 855-762-4638 or send us a message at info@cmagnets.com.